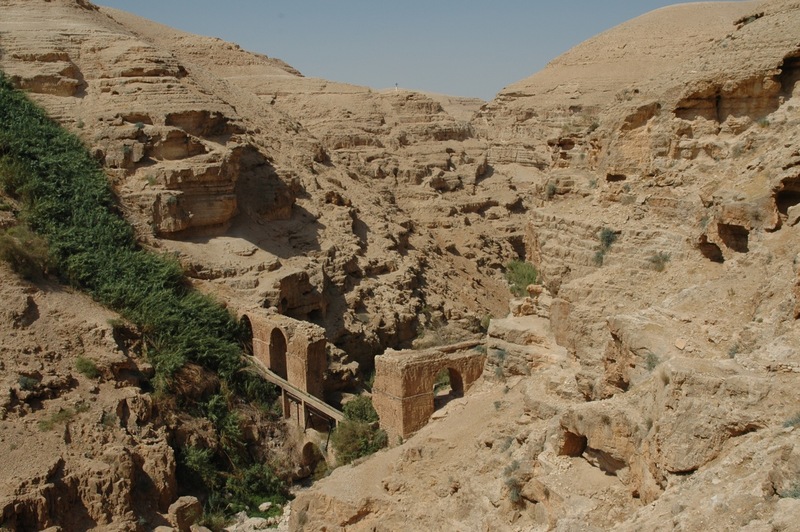 Hiking Wadi Qelt is best in the early morning on the way down to the Dead Sea, a great place to experience the Judean desert and for photographs of the desert landscape. From Jerusalem on highway <1> take the left at Mizpe Yericho, left again and left at the T. Park the car here for a great view of Wadi Qelt/Nahal Prat. Follow the black trail down to the stream bed. Here you will see the remains of the stone arches of the bridge of the aquaduct. Continuing another 450 meters you’ll come to a wooden bridge that crosses Nahal Prat and to your left is the Ein Qelt pool. There are two possibilities from here: hike west along the streambed to a string of pools in Lower Nahal Prat or east along the red trail which will take you after about 2 kilometers to the monastery of St George of Koziba perched on the northern cliff. From the monastery you can climb up to the road where you drive back to the highway or continue to the ruins of Herod’s fortress at Cypros. 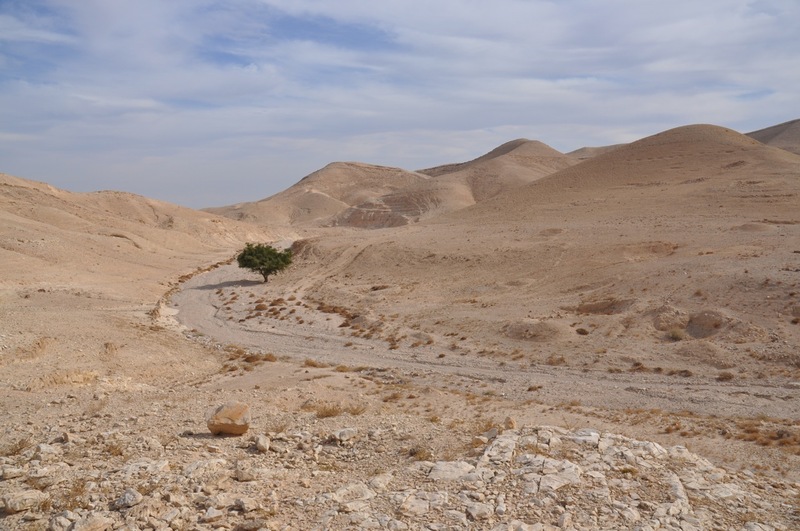 Christian monks began to settle in the Judean Desert in the early 4th century identifying with Moses, Elijah, Jesus and others who spent time in the desert, as a respite from the secular world. 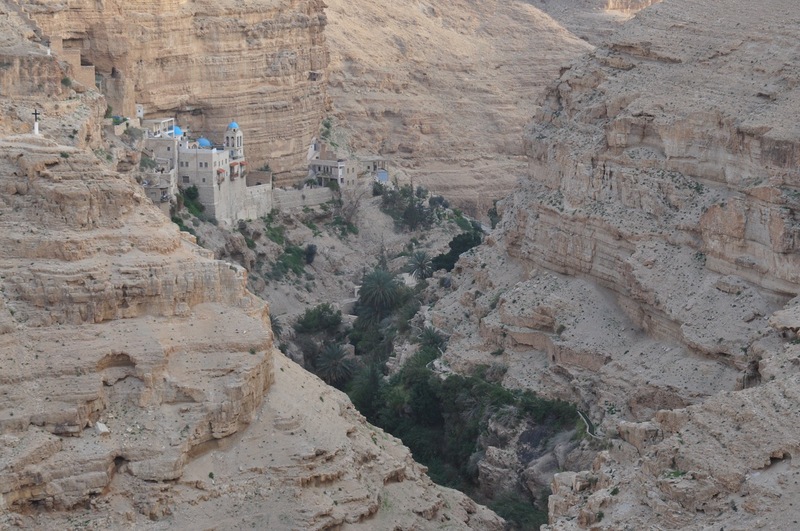 By the fifth to seventh centuries, there were some 65 monasteries in the area: St. George, Martyrius, Euthymius, Deir Hijla, Mar Saba can be visited to this day. 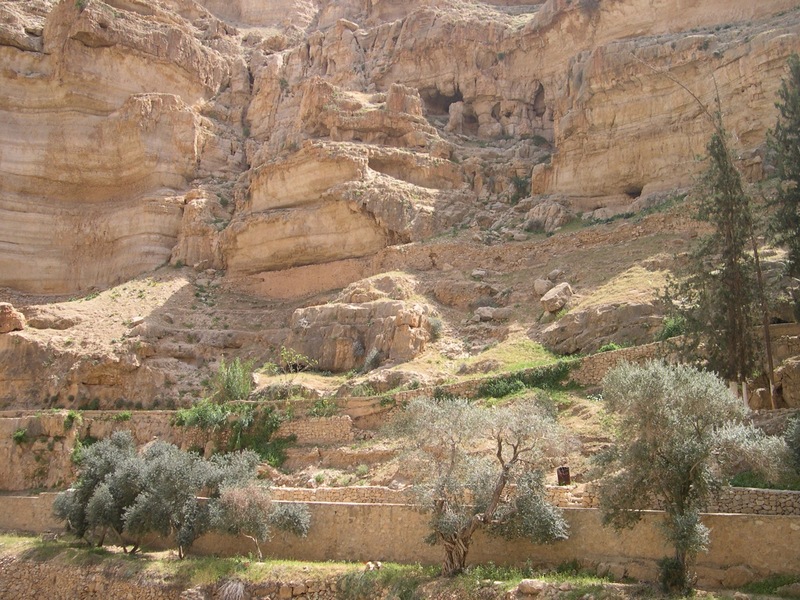 Originally founded as a laura, a cluster of cells or caves for hermits about 420 CE, a small chapel was added later and about 480CE St. John of Thebes transformed the site into a monastery. In the 6th century it became known as St. George under the leadership of Gorgias of Koziba, born in Cyprus about 550 CE. The Persians destroyed it in 614 and it was rebuilt during the Crusader period but abandoned when the Crusaders were defeated and was reported in ruins by a pilgrim who visited in 1483. In 1878 a Greek monk, Kalinikos, settled here and restored the monastery, completing it in 1901. 5 So he went and did according unto the word of the LORD; for he went and dwelt by the brook Cherith, that is before the Jordan. 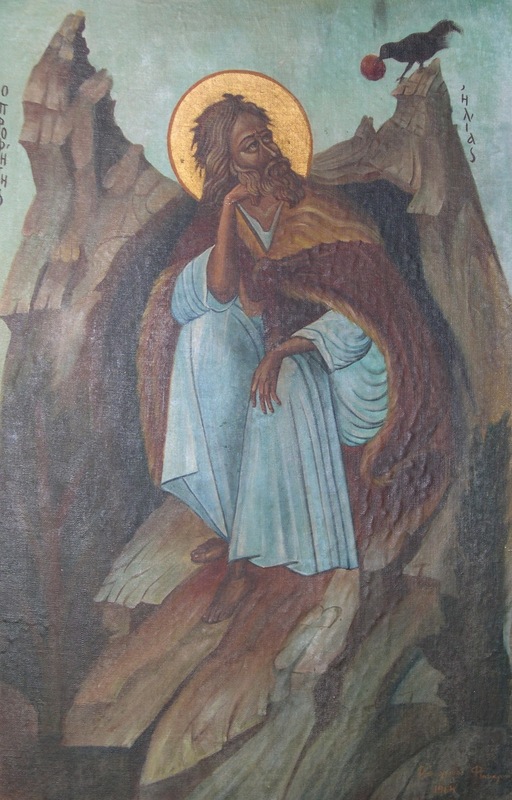 There is also the story that Joachim, father of the Virgin Mary, hid here for forty days bewailing the barrenness of his wife Anne, whereupon an angel came to him to announce that Anne was pregnant with a daughter. 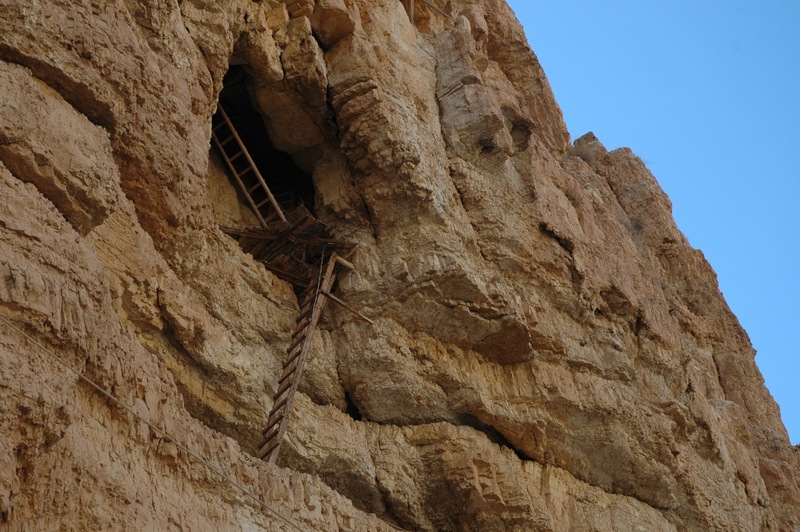 This entry was posted in Desert, Hiking, Nature, Photography and tagged desert, Hiking, monastery, postaweek2011 on October 30, 2011 by Shmuel Browns.